Hawaiʻi Island police have located the North Kohala man who had been reported missing. 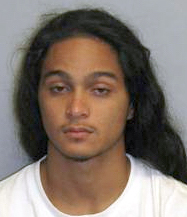 23-year-old Israel Victorino-Rabang was located Tuesday morning, (July 3), in Hawi. He is deceased. The case is being investigated by the Area II Criminal Investigation Section as a Coroner’s Inquest. No foul play is suspected. An autopsy will be conducted later this week to determine the exact cause of death. Police are searching for Israel Victorino-Rabang, a 23-year-old Hawi man. Victorino-Rabang is 5 feet 6 inches tall, about 150 pounds and has long hair. Victorino-Rabang was last seen wearing dark shorts and no shirt riding a skateboard on Kumakua Street. Victorino-Rabang is mentally unstable and requires medication. Police ask anyone with information on his whereabouts to call 9-1-1 or contact police.